A car wash might not be as dangerous as a skydiving expedition or NASCAR race, but it’s not without its hazards. Anytime you come into contact with heavy machinery, water, and/or chemicals, it’s a good idea to take a moment and look at all the potential dangers. This is especially true if you have children or pets who will be accompanying you to the car wash. Follow All Regulations: Any signs or warnings that are posted at the car wash are there for a good reason. Always adhere to your car wash’s specific rules and regulations as a good base for safety. Pay Attention to Parking Brakes and Your Gear: In an automatic car wash, you’ll be asked to put your car in neutral and make sure the parking brake is off, since the machinery will be pulling your car along. For self-service washing, the opposite is true. When you park inside the bay, make sure your vehicle’s parking brake is on to avoid accidental rolling or rocking. Remove Loose Items: A sideview mirror that has a tendency to come loose, an oversized aftermarket antenna, a piece of rubber weatherstripping that pops out from time to time—every car has its little quirks. Make sure you remove or secure any item that could potentially pull away from your vehicle before you arrive. Lock All Doors: In an automatic car wash, it’s a good idea to make sure the windows are up and all doors are locked before you head through. Pets and passengers have been known to accidentally open a door and let in the water, which can be disastrous for your interior. Dress Appropriately: You don’t have to carry a special change of clothes for the car wash, but it’s a good idea to consider both the weather and the wet environment when you stop by. For a winter wash, a waterproof jacket and rubber gloves make all the difference. Non-slip shoes are always a wise choice. And if you have any sensitivity to soaps or wax, make sure you wear protective gloves no matter what the weather. No Direct Spray: The water that comes out of the spray nozzle can be very high pressure, and isn’t meant to be used on humans or pets. Keep the spray confined to the car as much as possible. Keep Kids and Pets Inside: As much fun as it might be for your kids to pop out of the car and “help” as you do a self-serve wash, it’s best to keep them in the car. A car wash is a busy place with lots of vehicles coming and going, which makes it a safety hazard for children and pets. Like many washes, our self-serve car wash is open 24 hours a day. 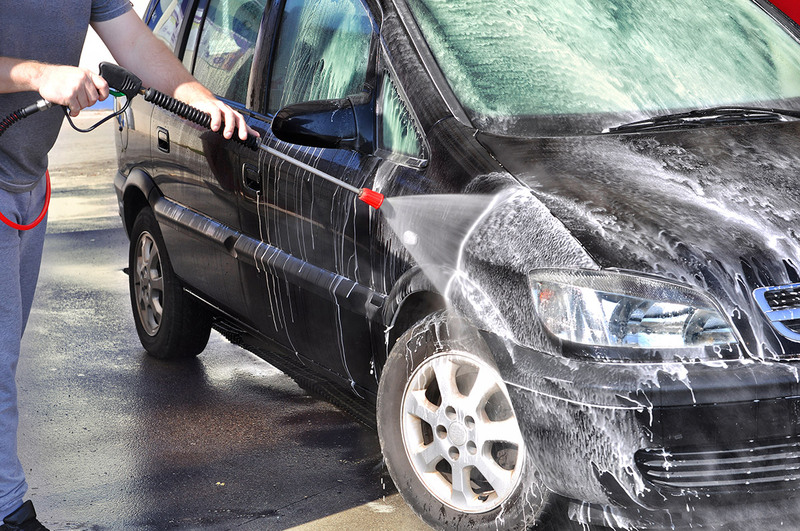 While Utah Auto Spa is located on a major street and surveillance cameras are recording, consider visiting during daylight hours if you’re coming to the car wash alone. It’s always a good idea to be aware of your surroundings and you can never be too careful.